There are some corps shows that are universally loved by fans because the music is friendly and accessible, the melodies can be hummed while walking out of the stadium, and the show fills one with a spirit of enthusiastic positivity and jubilant exultation. Blue Knights seventh place 2006 production of "Dark Knights" is not one of those shows. Now, before my inbox gets inundated by dozens of irate responses, the concept of warm and fuzzy was not on the short list of things the show creators were attempting to convey. The show was intended to be very … well … dark, based on the Samuel Barber "Piano Concerto Op. 38," a work that first made an appearance in the corps' 13th place 2002 show, "Fear and Trembling." Like this 2006 production, that earlier show would never be confused with the soundtrack for a movie about unicorns and rainbows. The source material is highly regarded in music circles. Commissioned by his publisher, G. Schirmer Inc. for the company's 100th year in business, the piece won Barber his second Pulitzer Prize in 1963. (His first came in 1958 for his opera "Vanessa.") It was performed in late 1962 as part of the opening ceremonies for what is now Avery Fisher Hall at New York's Lincoln Center and also won the Music Critics Circle Award in 1964. 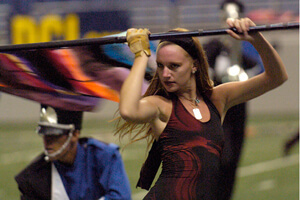 "Dark Knights" wasn't for the drum corps squeamish. It was angry and bombastic and yet quite astoundingly introspective, very much like Barber's tortuous musical soul, (a trait he shared with Shostakovich, whose music comprised the rest of the corps' 2002 show). However, while the music challenged fans to open their ears, the audience had no problems keeping their eyes from shutting down. Corps members leaped high through the air and rolled on the ground with such conviction, visually conveying the angst of the music. There was no storyline. The show was entirely about the music. Starting with solo chimes and a lovely front ensemble percussion prelude, the horns, playing backfield, combined the sultry intro from "Allegro appassionato," the first movement of the concerto, with hints of the haunting "Canzone: Moderato" of the second movement. Richly colored hand-painted flags, a corps trademark, popped forth when the tempo picked up, highlighting the angst of the music with a quasi-striped design emboldened by a plethora of regal colors, both bright and dark. Those contrasting colors helped emphasize the various forces of the music that seemed to be pulling against one another, trying to rip the musical fabric apart at and between the seams. Performance excerpt of the 2006 Blue Knights. The music was largely angry and unforgiving, but in a subdued and restrained manner, accompanied by swirls of jumping masses of marchers. This was especially true in the concerto's third movement, the 5/8 "Allegro molto." A repetitive mallet motif was joined by an ominous melody by the tubas, fragments of the melody then segmented in various segments of the horns from different locations on the field. Often, the front ensemble was regarded as the pianist in Barber's original score and the brass and percussion as the orchestra. "Canzone: Moderato" briefly re-appeared; its darkly harmonic, melancholy melody providing a respite from the overwhelming angst that bookended the lovely chorale. But the consoling beauty of the interlude was quickly interrupted by the "Allegro molto" movement, where all the brutality of Barber's angst-ridden passion was cut loose with abandon. With the keyboards outlining the flurry of pianistic abstractions of the harmonic material serving as an underlying ostinato, the horns unleashed a series of sharp jabs that cut through the air as a blazing-hot sword would cut through a quivering stick of soft butter. After a sudden break in the music, the mallets slowly built up speed as the guard coalesced toward the front and center of the field, with the horn players crouching and observing the proceedings. During what was a piano cadenza in the original, the horns then, well, let me quote from my World Championships Finals blog that year: "My personal favorite part of the show, one of my most favorite moments in any show this year, is the swirling mass of humanity that comes across like a spinning collection of gases forming into a star in the outer reaches of the solar system. And then the corps marches out of it as if pulling the drapes open on a day greeting us outside with the explosion of a hydrogen bomb. Nothing too cataclysmic, just a little drum corps with a side order of upheaval and calamity." There to the end, with its vivid abstractions of angry piano and orchestral outbursts, the show made no attempt to convert anyone who was still on the fence regarding its accessibility. You were either sold on the idea by then or you weren't. But if you had been assimilated, the final two minutes was a brainwave pounding, stilettos-to-the-ear drums, head thrashing equivalent of riding atop a mosh pit at a heavy metal concert. The sheer ruthlessness of the music, culminating with the entire horn line crouching upon the conclusion, was a final slap across one's quaking consciousness, akin to being shaken awake as a warning to get out of the road, just after being run over by a truck. This week only, you can save on 2006 World Championship Audio and Video Performance Downloads on the DCI Fan Network. Buy the 2006 Blue Knights Video Performance Download. (Available this week only for $3.99. Regular price: $4.99.) Buy the Audio Performance Download bundle of all 12 Finalists from 2006. (Available this week only for $15.99. Regular price: $19.99.) Offer ends Monday, April 2 at 8:30 a.m. ET.